Hi Anese! Welcome to your thread for Gab's Army, my mentoring program. 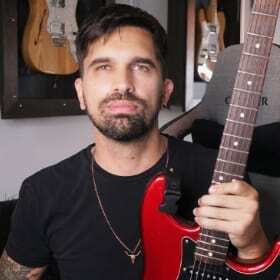 Here I will guide you with your guitar practice, creating routines, practice plans, giving feedback of your playing always based on your guitar goals and musical tastes. Before we start I would like to know a bit more about you. - How many time have you been playing guitar? - Favorite guitarists, bands and musicians. - What are your guitar goals? - How would you like to you see yourself in 5 years (related to music and guitar)? - How many time can you play guitar each day? - Do you have playing live experience? - Which are your strong and weak points with guitar? - What do you know about music theory? - Can you record videos of you playing? - Share here audios and videos that reflect your current playing. Thanks for accepting me in your monitoring program . here's some of info about me that might help you. then last year I decide to start looking on the internet to learn what I actually liked about the instrument. zztop, the Georgia satellites, red hot chilli peppers, tenariwen, pinkfloyd, eric clapton, satriani, steve via. guns n roses I also like blues and folk metal but I cant recall any favorite band at the moment. maybe I'd start to make clean good covers of my favorite solos and bands .. compose some good solos and guitar riffs.. to upload on my channel !! since that's the only stage I can rely on where I live. I can practice from 2 to 3 hrs everyday. I havent played live before, no .. not even with my friends .. haven’t known anyone who share the same passion before. what's my weakest and strongest points ? I guess I still know little about guitar to answer that properly.. but in a technical point of view .. Id say that my hands tends to sweat a little and that makes the whole playing experience uncomfortable .. but it doesn’t bother so much till now except in the summer where the weather gets too hot. I know the basic stuff about music theory .. timing, major and minor chord construction, major and minor scales, the pentatonic scale ..
but once I guess better in playing I'll spend some money on a good cam and learn more about making good videos. wanna c some vids ? watch the links above and you can also check my posts in the Rec room. and the lesson I'm working on right now is Ben's vibrato odyssey I'll upload my take here..
I’m not done with it yet I still have more work to do on it. if you have any more questions plz let me know. Hi Anese! Thanks for this info! Your classical guitar videos are really cool. I think that having learn to play that stuff is a great background for you. I remember Zakk Wylde saying on an interview that he took classical guitar lessons and then when he switched to electric he used that technique combined with pick in an hybrid technique called Hybrid Picking, and he is a monster on it! I've been also checking some of your REC takes, picking hand, power chords. Could you please post here the last take of each of the GMC lessons that you've worked? I have looked through both of the lessons, and they seemed fine to me, I have not looked through all of your rock rhythm lessons yet, but if I found a one that i liked more I'd let you know. however, I'd rather finish working on my vibrato lesson and take it to the REC room before I step on the new lessons . so have you listen to my vibrato lesson take ? what do you think? if you have other practice plans, please let me know. Hi Anese, your plan sounds good to me. Your vibrato work is evolving good. There are many parts that sound really good while some others need still to be polished. I notice that there are some moments the rhythm of your vibrato doesn't go with the groove of the backing (ex: 00:25), and there are also some pitch issues, mostly when you move to higher notes (for example at 00:12). The last notes of the lesson have more notorious pitch issues (00:55). To clarify, I think that your take on this lesson is not bad, but you have to focus on this details to master it. Practicing over the original lesson can really help for this. can you check and let me know how is it. specially about the rhythm in the third part. it says i can not upload these kind of files. Hi mate, rhythm is much better on this new take. There is still some room to make the 8th notes and triplets even tighter but you are very close. Practice the tune a bit more over the original lesson and then get back to the backings track, I think that you'll master this soon. About guitar rig files, I think that you can share them if you first zip the files. Try it and let me know. tone color, if you have please zip it and send it over to me. Hi Anese, what version of Guitar Rig are you using? version 5.0.2 (R2476), why ? ok! to be able to open it because I don't use it! I'll check if there is a demo version to open your preset. By the way, could you please share some print screens to let me see your current settings? here i attached two screens, this was a preset already included in Guitar rig, I had to change some nobs to get a better sound. even though it seems complicated but this is the only one i could find which is so close to the original lesson tone color. There you also have the EQ balance that can be a starting point. Please try it and let me know what happens. more comfortable with the preset that I previously used. Well, this amp that you are using will have more sustain and mid bass frequencies than Marshall so if you like it more you can keep it since that's related to your taste and can help to develop your own tone/style. The audio sample sounds good. The vibration could be a bit wider to reach the original but the speed is very close. How does it sound over the backing? sorry that took a little while but did my best to make it sound as close as possible. I noticed that my guitar volume was a bit louder than the backing track and I thought it would sound better if i lower the volume. here's another take I recorded today. check it and let me know what you think. Hi Anese, thanks for the audio. I can say that your vibrato is evolving well but the pitch that you are reaching is not precise. The slower vibrato is a bit lower than the pitch while the faster is higher. The timing is ok, but you have to be careful with pitches.